"Let's have another Libya" is perhaps not the best messaging. In October of 2011, US-backed rebels sodomized Libyan leader Muammar Gaddafi with a bayonet, then killed him in a brutal summary execution after his convoy was hit by NATO airstrike when fleeing Sirte. He had been found by his killers hiding in a ditch after which a grainy cell phone video showed the blood-splattered and newly overthrown leader being mocked and tortured just before being shot at close range in the head. News of this had caused one of the key Libya regime change architects in the Obama administration, then Secretary of State Hilary Clinton, to laugh gleefully while saying "we came, we saw, he died". This left Libya a failed state. Apparently this is the fate Florida Senator Marco Rubio wishes for embattled Venezuelan President Nicolas Maduro (who happens to be sitting atop the world's largest proven oil reserves), as on Sunday Rubio tweeted out a photo showing the contorted blood soaked face of Gaddafi while being dragged to the place of his field execution, side by side with one showing him previously enjoying his power and wealth. However, we don't imagine the people of Venezuela will find US/NATO "liberated" post-Gaddafi Libya very attractive, considering it has existed since Gaddafi's overthrow in a state of anarchy run by competing warlords, now with at least three governments vying for control. We've previously detailed a number of times how Libya went from being a stable, modernizing secular state to a hellhole of roving jihadist militias, warring rival governments, and open-air slave auctions of captured migrants. Does Rubio think the masses of Venezuelan people really want this? Clearly, Rubio doesn't actually care about ordinary Venezuelans, but is merely thirsty for yet more blood-soaked regime change in another oil-rich country. 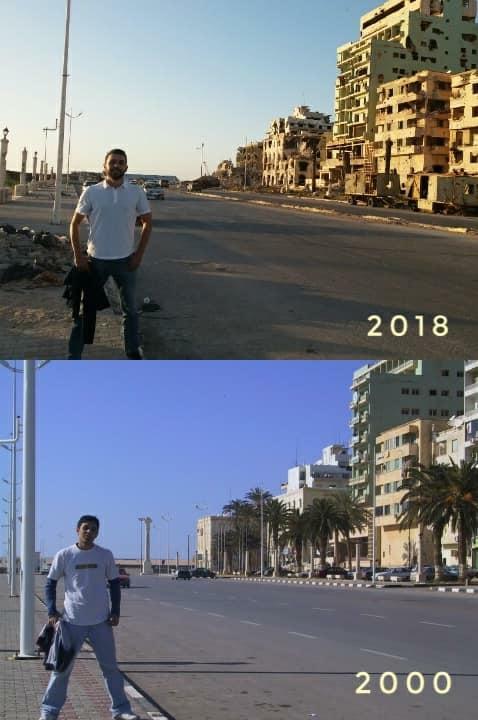 Below are Libya "before and after" photos. Much of Libya remains years after the US/UK/French-led NATO bombing campaign a crater and bullet-hole ridden wasteland that's very far from the "democracy" and "freedom" campaign preached by both neocons and liberal "humanitarian interventionists". To be expected Hillary Clinton herself weighed on Venezuela over the weekend, demanding that Maduro allow US aid trucks into the country. Journalist Glenn Greenwald translated Hillary's demand, saying Venezuela is actually allowing — contrary to most or all mainstream media reporting — humanitarian aid into the country, but "just not allowing the countries - such as US - vowing regime change to enter." This is due in part because, wrote Greenwald, the Venezuelans "have undoubtedly looked at the effects of the regime change you brought about in Libya and tried to bring to Syria and concluded it's not very attractive." Rubio's tweet, clearly a thinly-veiled death threat aimed at Maduro, comes after he told Axios last Wednesday that this past weekend, Saturday in particular, could ultimately decide the fate of Maduro as the standoff over aid would come to a head, given the opposition would stand ready to force the issue in as visible way as possible. But with Saturday come and gone, Maduro's fate appears far from being decided, even as the White House has declared "all options on the table" and as the hawks talk regime change.